Dontech offers a variety of vacuum deposited antireflective (VAR) optical coatings for reducing specular reflections from the surfaces of optical substrates. VAR coatings are used in applications where very high ambient light readability is required, such as in avionic cockpit displays. They are also used when antireflection properties are required without any degradation to the resolution of the transmitted image. VAR coatings accomplish reflection reduction by converting reflected energy into transmitted light. Dontech’s standard VAR coatings are designed around the photopic response of the human eye; hence, coatings are tuned for the spectral region of 425 nm to 675 nm (i.e., the dominate portion of the visible daylight spectrum). Exact performance specifications are both wavelength and angle based. Typically these coatings are comprised of three or more thin layers or stacks of dielectric and conductive transparent oxide materials, which are applied using high vacuum evaporation or sputtering processes. The specific coating process and configuration will vary with the desired level of performance, substrate and hard coating (if any). The deposited materials for coatings are selected based on index of refraction, spectral transmission, conductivity, durability, cost and required coating temperature. Higher performance coatings may be achieved by integrating more layers into the optical stack; however, the increase in performance will quickly become very small especially when compared with the increase in coating costs. These coatings include VAR-0.25, VAR-0.5, and VAR-0.75. 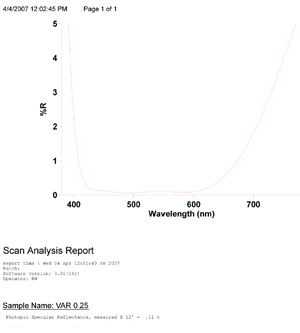 The name indicates the average maximum percentage photopic specular surface reflection for normal incident white light (i.e., VAR-0.25 has a maximum total luminous reflection of illuminant D65 of 0.25% maximum). Dontech can design custom vacuum deposited coatings to satisfy special requirements. Dontech application engineers can recommend the antireflective coating best suited for your application. For additional information on antireflective coatings, please contact a Dontech applications engineer, or request that a hard copy of the Windows Design Guide be sent to you.